As parents, you’ve probably noticed that children understand way easier and more things at once if they learn about them in a fun game than to strictly follow rules or instructions. Well, we have noticed that too – on a professional educational level in the programs included in LuckyKids – children’s camp in Bansko for intensive training in English for children from 5 to 14 years. The program was developed specifically for the needs of the camp. The study material is carefully selected and systematized by a team of professionals, including the coordinator of the English department and teachers in LuckyKids. When the kids are taking part in lots of games, fun, memorable experiences in the mountains, they actively and willingly develop better skills in reading, writing, comprehension and grammar of the English language. To participate in this children’s camp in Bansko, which is very similar to the summer language courses abroad, your kid must have at least basic to middle level of proficiency. The main focus of the training is to develop and enhance the language skills of the children through both lessons and learning the material and through a variety of games and entertainment, where they can build new friendships in a multicultural English-speaking environment. The focus in class is reading and listening comprehension of English. In fact, in this camp in Bansko the kids learn English language 24 hours a day. Besides teaching at the language school, all activities are conducted in English. Communication between children, communication with teachers, instructors and animators, who organize the events, it all happens in English. Lecturers come from English-speaking countries – so their English is native and they also have a rich teaching experience. The animators are Bulgarians with years of experience in organized fun and entertainment events in English. They make great efforts to create a cozy, comfortable and interesting environment for the children. This is a camp in English where we don’t just “strike” the kids with knowledge – instead we use stimulating and provocative topics that help each child to improve its language level individually according to special methodology courses at the camp. Children learn how to discover the knowledge and how to use their full capacity to understand it. The training team is not formed by “bosses” to the kids but instead by helpers and guides. Their job is to advise and encourage kids’ talents and unique qualities while simultaneously develop skills in teamwork and commitment to the common target. In LuckyKids language camp the point of training is to improve all areas of knowledge; the children practice reading, writing, speaking, listening comprehension and grammar altogether. The knowledge they acquire can be successfully applied to new projects and by participating in afternoon activities under the supervision of the English-speaking teachers and animators. 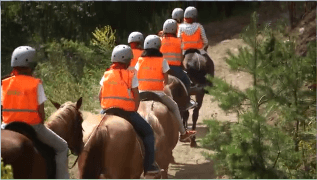 And these activities truly are different from one another: horseback riding, swimming, cycling, archery, painting, paintball, hiking, tours and more. Evenings are also filled with entertainment – campfire, karaoke, disco, night treasure hunt, film night gala… Of course, children are never left alone and each activity is provided with all the safety measures needed. Swimming, for example, goes under the supervision of a lifeguard, a teacher and an animator. In the mountains helmets and other protective equipment is mandatory while the kids are also accompanied by professional guides and a well equipped paramedic. In fact, the international children’s camp LuckyKids keeps the traditions of the world’s best practices, including safety. The camp is based at the Lucky Bansko Aparthotel, in the heart of the mountain, which is specially designed and adapted for the security of the children – with shatterproof glass, soft flooring, and no sharp edges. Camping kids are housed on a separate floor of the hotel where there are also the animators rooms in order to protect and supervise them during their stay, as well as for the night. So, the only question that remains for you and your children – what do you prefer, a 7 or a 14 day course in LuckyKids in Bansko? Next Post: See with what a nice gift to surprise your kids!